Since 2011, CMS has provided financial incentives to healthcare providers who implement and “meaningfully use” certified health information technology. Incentives to date have focused on providing patients the ability to view, download, and transfer data electronically. Although the incentives do not specify how organizations are to meet these criteria, most primary care practices and other healthcare delivery organizations have chosen to purchase electronic health records (EHRs) and accompanying patient portal software to meet these requirements.1,2 Neither how these online portals are being adopted nor their potential influence on known health disparities has been fully explored. We describe how a patient portal was initially used among an insured, sociodemographically diverse population receiving primary care within an integrated health system. This system was selected for its relatively early adoption of patient portal technology and for the comprehensiveness of portal features initially made available to patients. We report the extent to which members of traditionally disadvantaged subgroups of the population (ie, those from minority races, those for whom English is not a first language, and those of Hispanic ethnicity) and those known to have disproportionate health needs (ie, older patients and those with more comorbidities) had activated portal accounts (ie, were portal adopters). Among adopters, we further evaluate which health-related portal features were accessed. Of particular interest was the extent to which adopters accessed features that enable viewing test results and health history information versus accessing the more interactive features that allow adopters to manage and exchange health-related information. In doing so, we provide important information regarding the patient portal foundation upon which subsequent patient engagement capabilities are being built, and we identify subgroups at risk of being left behind as healthcare organizations increasingly rely on portal technology to enable patients to electronically view, download, and transmit their health information to a third party. The study was conducted in an integrated health system serving metropolitan Detroit, Michigan. The health system’s institutional review board approved all aspects of the study protocol. In 2012, the health system purchased an enterprise license for EpicCare EMR, a commercial medical record software program, and its accompanying patient portal, MyChart.27 As originally implemented, patients seen in any of the health system’s 26 primary care clinics were able to use MyChart via a desktop computer, tablet, or mobile device to securely schedule appointments, receive appointment reminders, view test results, request prescription refills, view and manage information about their health, and send secure messages to care teams. Portal implementation was a systemwide initiative, with patient- and clinician-targeted campaigns. Screen savers introducing MyChart were launched on examination room computers and other work­stations. Posters were placed in clinic elevators, clinician work areas, examination rooms, and waiting rooms. Informational brochures were available in all clinics. Each component of the campaign instructed patients on how to request a MyChart activation code via the health system’s website or call center. Activation codes were also included on patient discharge summaries. All clinical staff received MyChart training, and front desk staff were instructed to inquire about patients’ account activation status. Work processes were adjusted to prioritize answering patient portal messages over telephone messages. We identified patients 18 years or older enrolled in the health system’s affiliated health plan with at least 1 visit to their primary care physician between April 1, 2013, and March 31, 2014. Patients younger than 18 years, those without a primary care visit, and those with indeterminate portal activation status (eg, those with account information but no evidence of a session) were excluded. Patient sociodemographic information, comorbidities, primary care visits, and portal activation information were obtained from the health system’s EHR data repository. These patient-level data were joined with clinic-level information available from health system administrative files. “Portal adopters” activated their portal account and initiated at least 1 online session between December 1, 2012, and March 31, 2014. Among portal adopters, we examined which health-related portal features were accessed (ie, “clicked on”) between April 1, 2013, and March 31, 2014, in 4 categories: (1) messaging, (2) appointment management, (3) visit/admission summaries, and (4) medical record access and management. Adopters were considered to be users of the messaging feature if they (1) viewed electronic test result letters or other personal communications from their physician, (2) sent a message or viewed a response related to prescription refills, or (3) sent a message or viewed a response related to general medical advice. Those who reviewed their upcoming appointment information or accessed the appointment scheduling feature were considered to be users of the appointment management feature. Adopters who viewed outpatient visit summaries and/or inpatient admission summaries were deemed users of the visit/admission summaries feature. Finally, adopters who accessed the following features were considered to be users of the medical record access and management feature: test results, health summary, current health issues, medications, allergies, preventive care, medical history, immunizations, and/or home monitoring reports. We also constructed a binary variable (“interactive feature use”) that indicated whether the adopter had ever (vs never) clicked on a feature that enabled them to input information (eg, update health issues, update medications, update allergies, send a secure message to their doctor, or request a prescription renewal). We also obtained information on patient gender (female/male), marital status (currently married vs other), and patients’ realized access to office-based primary care. The last was measured by whether the patient had a health maintenance exam visit (ie, “checkup”) and by the total number of primary care office visits within the 12-month study period. In addition to the patient-level variables, we controlled for 3 clinic-level factors that may affect portal adoption and feature use: the number of primary care physicians practicing at the clinic (a proxy for clinic size), whether medical students and/or residents saw patients at the clinic (ie, designated teaching facility), and whether the clinic was located within the city of Detroit (urban) or a surrounding area (suburb). A multivariable logistic regression model with random effects was fit using the PROC GLIMMIX procedure (SAS software, version 9.4 [SAS Institute Inc; Cary, North Carolina]) to test the role of the patient-level factors of interest in portal adoption status, controlling for other patient- and clinic-level factors. Patients were blocked by physician and nested within clinic, and the Laplace method was used for likelihood approximation. 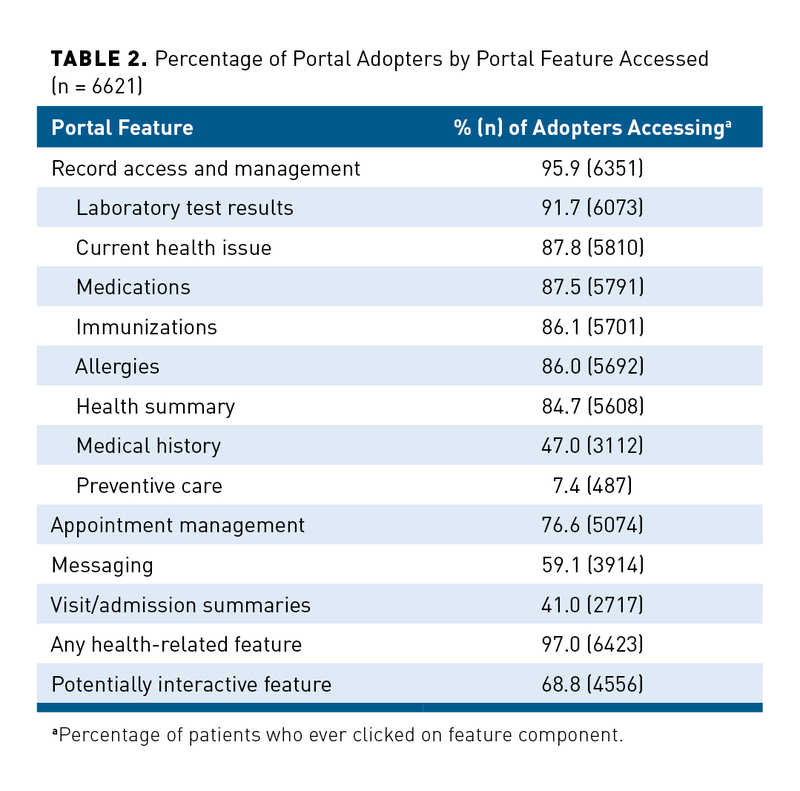 Among portal adopters, we report the percentage of patients accessing each of the 4 categories of portal features (messaging, appointment management, visit/admission summaries, and medical record access and management) as well as by whether or not an interactive feature was accessed. We used multivariable logistic regression to test the role of the same patient-level factors of interest in feature access, again controlling for other patient- and clinic-level factors. Because adopters’ feature access was not influenced by the clinic from which or physician from whom care was received (ie, interclass correlation coefficients <0.01), models were fit using PROC LOGISTIC (SAS version 9.4). Table 1 describes the sociodemographic and other characteristics of the study population (N = 20,282). About one-third of study-eligible patients (32.6%) were portal adopters (n = 6621). The majority (92%) of adopters had at least 2 online sessions, and 86% had 3 or more sessions. Reflecting the relative newness of the portal’s availability, patients who were adopters had been using the portal for a mean (SD) of 8.9 (4.5) months, with 95% using their account for at least 1 month. Across the health system, patients’ portal adoption rates ranged from 6.8% to 64.9% among primary care clinics (interclass correlation, 0.067) with a mean (SD) of 32.7% (12.4%), and from 0% to 100% among primary care physicians (interclass correlation, 0.060) with a mean (SD) of 31.1% (20.2%). Prior to controlling for other factors, African Americans, those of Hispanic ethnicity, those preferring to use a non-English language, and those 70 years and older were substantially less likely to have an activated portal account (Table 1). It should be noted, however, that portal adoption among these vulnerable and relatively high–health-need populations varied substantially across physician panels and primary care clinics. For example, on some physician panels, as few as none (0.0%) of the African American patients had an activated portal account, whereas on others, all (100.0%) African American patients had a portal account. Similarly, at some clinics, as few as 4.5% of the African American patients receiving primary care from the clinic had an activated portal account, whereas at others, the percentage was as high as 52.9%. Similar variability at the physician panel and primary care clinic levels was seen for the other subgroups of interest. Multivariable logistic regression model results comparing portal adopters with nonadopters are also presented in Table 1. 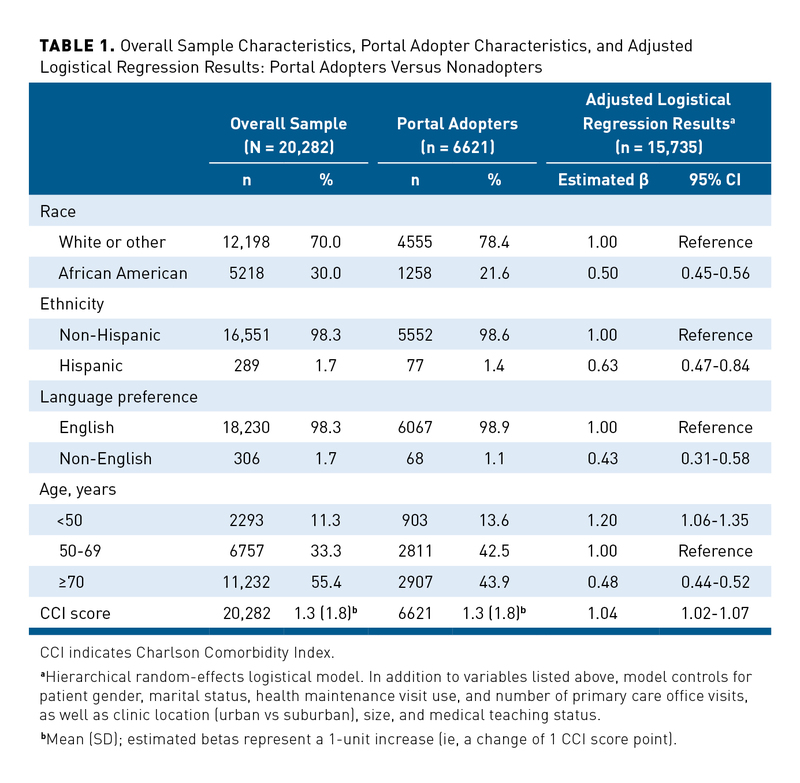 After controlling for other factors, African American patients were half as likely as patients of other races to be portal adopters. Similarly, compared with patients aged 50 to 69 years, those 70 years and older were approximately half as likely to be portal adopters. Those of Hispanic ethnicity and with a preference for a non-English language were also significantly less likely to be portal adopters, whereas portal adoption was more likely among patients with higher CCI scores. Most adopters accessed portal features related to medical record access and management (95.9%) (Table 2), most often to obtain laboratory test results (91.7%). As depicted in Table 2, adopters also frequently accessed information on their current health issues (87.8%), medications (87.5%), immunizations (86.1%), allergies (86.0%), and health summaries (84.7%). The majority of adopters also accessed the appointment management features (76.6%), more frequently to review information on upcoming appointments (73.1%) than to schedule appointments (58.5%). Relatively fewer patients accessed the messaging features (59.1%), and within this category, access was evenly distributed across letters (35.5%), medical advice requests (31.7%), and medication renewal requests (31.3%). Fewer patients had accessed the visit/admission summary component (41.0%). Overall, 97.0% of portal adopters accessed at least 1 of the health-related features available within the portal, with 68.8% accessing at least 1 interactive feature. Table 3 presents results from the 5 multivariable logistic regression models testing the association of the patient-level factors of interest with feature access. With the exception of accessing visit/admission summaries, patients of African American race were significantly and substantively less likely to have accessed each of the portal features. Similarly, with the exception of record access and management (which virtually all [95.9%] patients accessed), patients 70 years and older were also significantly and substantively less likely to have accessed each of the portal features. On the other hand, as a patient’s CCI score or number of primary care visits increased, so too did their likelihood of accessing the different portal features. We found that approximately one-third of patients with a primary care visit were portal adopters, as defined by their having an activated portal account. Furthermore, the majority of portal adopters logged into their account multiple times and accessed a variety of features related to both viewing and inputting information. Together, these results illustrate the ability of patient portals to reach a large number of patients, particularly those who are already actively connected with a primary care provider. Our results should be interpreted with a number of study limitations in mind. First, to determine the types of portal features used by patients, we measured user clicks on the links to access specific portal features. Thus, our results are based on the links that patients activated and not time spent per se. Capturing use in this way is consistent with other studies9 but may nonetheless result in overestimates of patient feature use because some clicks may have been due to curious exploration and not actual engaged use. Second, although we were able to control for some clinic-level factors, because of the nature of our study methods and data, we were unable to control for some potentially important patient-level factors, such as education and income. We were also unable to determine the reasons behind patients’ adoption or nonadoption of the portal and specific portal features accessed. Understanding the multilevel and modifiable factors that contribute to observed patterns of portal adoption and feature access is a fruitful avenue for future research. In addition, the context for this research was 1 integrated health system that serves an urban/suburban Midwestern locale. As such, findings may not reflect patterns of portal adoption and feature access that are faced over the long term or by health systems serving other types of populations or based in other locations. Our results underscore the opportunities and challenges that patient portals present. On the one hand, when integrated within EHRs, portals represent an exciting new frontier for information exchange between healthcare organizations and patients. As such, portal technology may be able to support patients’ health-related decision making and adherence to evidence-based care (and thereby health outcomes) beyond what traditional office visits alone can accomplish. On the other hand, our findings caution that without purposeful planning and integration, reliance on patient portals alone for engaging patients outside of office visits could inadvertently serve to exacerbate existing racial and other social disparities. Our findings therefore highlight not only the need to continually assess the reach and impact of patient portals on diverse populations but also a need to consider alternative channels and mechanisms for sharing health information and engaging patients beyond the walls of traditional office visits. The views expressed herein are solely those of the authors and do not necessarily represent the views of the Department of Veterans Affairs or the US Government.